You know how we make all these New Year’s resolutions at the start of the year, but we know most of them are just empty promises waiting to be broken anyway? Yeah, well, one of the things I swore I’d do was to learn a new instrument this year. However, I never really bothered to actually make it happen. Until recently, that is. When we got to the artsy fartsy cafe, the kids’ workshop was just about to end. Adorable little boys and girls were performing solo pieces up on stage, and the room was full of smiles both from guests and proud parents. While waiting for the adults’ workshop to start, the sibling and I had something to eat. 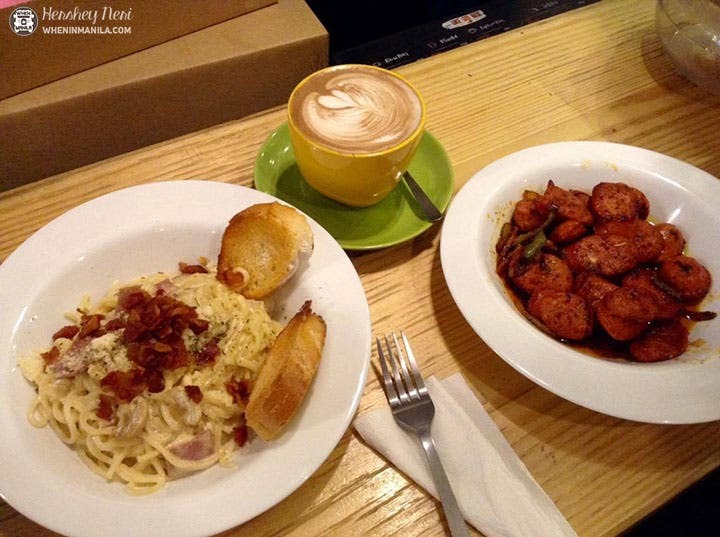 We ordered carbonara, german sausages, and a cup of hot latte. The food was around Php220 per plate, but it was really delish and the serving was big! (We actually weren’t able to finish the two plates.) We really liked their coffee, too. Before I tell you about the workshop, please allow me to give you a quick tour of the pretty place on the next page! LOOK: New Art Installations Found Around the Metro — Have You Seen Them Yet?